Q: What will happen if shaft earthing brushes are not provided for VFD driven motor? Is it acceptable? Motor is of 50 hp, 415 V, and is at 200 m from VFD panel. A: More than likely it will work just fine. Think of the shaft brushes as cheap insurance. They will make sure the bearings are protected from discharge current to equipment ground. On the other hand, the brushes will also ensure a long useful life from the motor by preventing even minute amounts of discharge current that will, over a long time, cause bearing friction to increase and then destroy themselves. The distance from the VFD to the motor doesn't matter so much in this regard. That is a concern when looking at the mismatch of inrush impedance. The pulses that come from the VFD have unrestricted inrush if the conductors are long and oversized. But when the hit the change of impedance at the motor connection box, they can spike on the leading edge of the spike. These spikes are voltages that translate into mechanical forces. 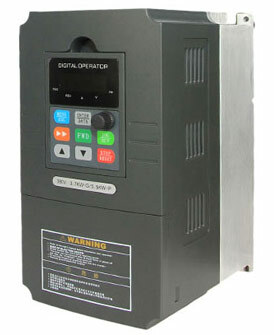 So if you have a 3 phase motor on 460 or 480 volts VFD, there can be as much as 1500 v p-p at the connection box. Those spikes are at the carrier frequency of the VFD so they will be anywhere from 3000-12000 Hz. And the rise/fall time of the pulses are in the pico seconds, not milliseconds like 50/60 Hz. This means the magnetic forces on the motor are tremendous. By limiting the inrush impedance of the field conductors you can help mitigate the effects of impedance mismatch.